The "51st state", in post-1959 American political discourse, is a phrase that refers to areas or locales that are – seriously or facetiously – considered candidates for U.S. statehood, joining the 50 states that presently compose the United States of America. The phrase has been applied to external territories as well as parts of existing states which would be admitted as separate states in their own right. The phrase "51st state" can be used in a positive sense, meaning that a region or territory is so aligned, supportive, and conducive with the United States, that it is like a U.S. state. It can also be used in a pejorative sense, meaning an area or region is perceived to be under excessive American cultural or military influence or control. In various countries around the world, people who believe their local or national culture has become too Americanized sometimes use the term "51st state" in reference to their own countries. Under Article IV, Section Three of the United States Constitution, which outlines the relationship among the states, Congress has the power to admit new states to the union. The states are required to give "full faith and credit" to the acts of each other's legislatures and courts, which is generally held to include the recognition of legal contracts, marriages, and criminal judgments. The states are guaranteed military and civil defense by the federal government, which is also obliged by Article IV, Section Four, to "guarantee to every state in this union a republican form of government". Congress is a highly politicized body, and discussions about the admission of new states, which typically take years before approval, are invariably informed by the political concerns of Congress at the time the proposal is presented. These concerns include or included maintaining a balance between free and slave states, and which faction in Congress (Democrats or Republicans, conservatives or liberals, rural or urban blocks) would benefit, and which lose, if the proposed state were admitted. Puerto Rico has been discussed as a potential 51st state of the United States. In a 2012 status referendum a majority of voters, 54%, expressed dissatisfaction with the current political relationship. In a separate question, 61% of voters supported statehood (excluding the 26% of voters who left this question blank). On December 11, 2012, Puerto Rico's legislature resolved to request that the President and the U.S. Congress act on the results, end the current form of territorial status and begin the process of admitting Puerto Rico to the Union as a state. Since 1898, Puerto Rico has had limited representation in the Congress in the form of a Resident Commissioner, a nonvoting delegate. The 110th Congress returned the Commissioner's power to vote in the Committee of the Whole, but not on matters where the vote would represent a decisive participation. Puerto Rico has elections on the United States presidential primary or caucus of the Democratic Party and the Republican Party to select delegates to the respective parties' national conventions although presidential electors are not granted on the Electoral College. As American citizens, Puerto Ricans can vote in U.S. presidential elections, provided they reside in one of the 50 states or the District of Columbia and not in Puerto Rico itself. Residents of Puerto Rico pay U.S. federal taxes: import/export taxes, federal commodity taxes, social security taxes, therefore contributing to the American Government. Most Puerto Rico residents do not pay federal income tax but do pay federal payroll taxes (Social Security and Medicare). However, federal employees, those who do business with the federal government, Puerto Rico–based corporations that intend to send funds to the U.S. and others do pay federal income taxes. Puerto Ricans may enlist in the U.S. military. Puerto Ricans have participated in all American wars since 1898; 52 Puerto Ricans had been killed in the Iraq War and War in Afghanistan by November 2012. Puerto Rico has been under U.S. sovereignty for over a century when it was ceded to the U.S. by Spain following the end of the bill of rights. Puerto Rico is designated in its constitution as the "Commonwealth of Puerto Rico". The Constitution of Puerto Rico which became effective in 1952 adopted the name of Estado Libre Asociado (literally translated as "Free Associated State"), officially translated into English as Commonwealth, for its body politic. The island is under the jurisdiction of the Territorial Clause of the U.S. Constitution, which has led to doubts about the finality of the Commonwealth status for Puerto Rico. In addition, all people born in Puerto Rico become citizens of the U.S. at birth (under provisions of the Jones–Shafroth Act in 1917), but citizens residing in Puerto Rico cannot vote for president nor for full members of either house of Congress. Statehood would grant island residents full voting rights at the Federal level. The Puerto Rico Democracy Act (H.R. 2499) was approved on April 29, 2010, by the United States House of Representatives 223–169, but was not approved by the Senate before the end of the 111th Congress. It would have provided for a federally sanctioned self-determination process for the people of Puerto Rico. This act would provide for referendums to be held in Puerto Rico to determine the island's ultimate political status. It had also been introduced in 2007. The Washington Post, The New York Times and the Boston Herald have published opinion pieces expressing support for the statehood of Puerto Rico. On November 8, 2012, Washington, D.C. newspaper The Hill published an article saying that Congress will likely ignore the results of the referendum due to the circumstances behind the votes. and U.S. Congressman Luis Gutiérrez U.S. Congresswoman Nydia Velázquez, both of Puerto Rican ancestry, agreed with the The Hill 's statements. Shortly after the results were published Puerto Rico-born U.S. Congressman José Enrique Serrano commented "I was particularly impressed with the outcome of the 'status' referendum in Puerto Rico. A majority of those voting signaled the desire to change the current territorial status. In a second question an even larger majority asked to become a state. This is an earthquake in Puerto Rican politics. It will demand the attention of Congress, and a definitive answer to the Puerto Rican request for change. This is a history-making moment where voters asked to move forward." Several days after the referendum, the Resident Commissioner Pedro Pierluisi, Governor Luis Fortuño, and Governor-elect Alejandro García Padilla wrote separate letters to the President of the United States Barack Obama addressing the results of the voting. Pierluisi urged Obama to begin legislation in favor of the statehood of Puerto Rico, in light of its win in the referendum. Fortuño urged him to move the process forward. García Padilla asked him to reject the results because of their ambiguity. The White House stance related to the November 2012 plebiscite was that the results were clear, the people of Puerto Rico want the issue of status resolved, and a majority chose statehood in the second question. Former White House director of Hispanic media stated, "Now it is time for Congress to act and the administration will work with them on that effort, so that the people of Puerto Rico can determine their own future." On May 15, 2013, Resident Commissioner Pierluisi introduced H.R. 2000 to Congress to "set forth the process for Puerto Rico to be admitted as a state of the Union," asking for Congress to vote on ratifying Puerto Rico as the 51st state. On February 12, 2014, Senator Martin Heinrich introduced a bill in the US Senate. The bill would require a binding referendum to be held in Puerto Rico asking whether the territory wants to be admitted as a state. In the event of a yes vote, the president would be asked to submit legislation to Congress to admit Puerto Rico as a state. On January 15, 2014, the United States House of Representatives approved $2.5 million in funding to hold a referendum. This referendum can be held at any time as there is no deadline by which the funds have to be used. The United States Senate then passed the bill which was signed into law on January 17, 2014 by Barack Obama, the President of the United States. Washington, D.C. is often mentioned as a candidate for statehood. In Federalist No. 43 of The Federalist Papers, James Madison considered the implications of the definition of the "seat of government" found in the United States Constitution. Although he noted potential conflicts of interest, and the need for a "municipal legislature for local purposes," Madison did not address the district's role in national voting. Legal scholars disagree on whether a simple act of Congress can admit the District as a state, due to its status as the seat of government of the United States, which Article I, Section 8 of the Constitution requires to be under the exclusive jurisdiction of Congress; depending on the interpretation of this text, admission of the full District as a state may require a Constitutional amendment, which is much more difficult to enact. However, the Constitution does not set a minimum size for the District. Its size has already changed once before, when Virginia reclaimed the portion of the District south of the Potomac. So the constitutional requirement for a federal district can be satisfied by reducing its size to the small central core of government buildings and monuments, giving the rest of the territory to the new state. Washington, D.C. residents who support the statehood movement sometimes use a shortened version of the Revolutionary War protest motto "
Will Puerto Rico Finally Become Our 51st State? ^ The Senate and the House of Representative of Puerto Rico: Concurrent Resolution. Retrieved December 16, 2012. ^ a b Rules of the House of Representatives : One Hundred tenth Congress (archived from the original on May 28, 2010). ^ ICasualties, accessed Nov. 2012. ^ Constitution of the Commonwealth of Puerto Rico – in Spanish (Spanish). ^ .CONDICIÓN POLÍTICA TERRITORIAL ACTUAL (English:Actual Territorial Political Condition) Government of Puerto Rico. State Electoral Commission. November 16, 2012 9:59PM. Retrieved November 18, 2012. ^ OPCIONES NO TERRITORIALES. (English: Non-Territorial Options). Government of Puerto Rico. State Electoral Commission. November 16, 2012. Retrieved November 18, 2012. ^ Will Puerto Rico Be America's 51st State? ^ Serrano: Plebiscite an "Earthquake" in Puerto Rican Politics Retrieved December 6, 2012. ^ "Pierluisi Introduces Historic Legislation", Puerto Rico Report, May 15, 2013. Retrieved on May 15, 2013. ^ " Sen. Martin Heinrich Presents Bill Seeking Puerto Rico Statehood", Fox News Latino, February 12, 2014. Retrieved on February 14, 2014. ^ D.C. Statehood: Not Without a Constitutional Amendment, August 27, 1993, The Heritage Foundation. ^ Jim Miller, "Six Californias initiative fails to make 2016 ballot", The Sacramento Bee, 09/12/2014. ^ Stephen Azzi, "Election of 1988". histori.ca. ^ "Tories ahead in tepid pool of election ads". Global News, September 25, 2008. ^ Carolyn Ryan, "The true north, strong and negative". cbc.ca, 2006. ^ (came into force on April 28, 1952). The song "Heartland" on the 1986 album Infected, by the British band The The, ends with the refrain "This is the 51st state of the U.S.A."
In 1889, Jules Verne and his son Michel Verne published the short story In the Year 2889, predicting that by the year mentioned the United States will have absorbed the entire American continent, as well as annexing the British Islands. The United States flag of that time is mentioned as having a hundred stars. In Americathon (1979), set in a fictional 1998, Britain (renamed as Limeyland) has become the 57th state, and the logo of the Safeway grocery chain hangs on the Palace of Westminster. In the novel 51st State (1998) by Peter Preston, Britain leaves the European Union and becomes the 51st state of the United States. In The Light of Other Days (2000), a novel by Arthur C. Clarke and Stephen Baxter, Britain joins the United States, with the Prime Minister serving as governor and the Royal Family exiled to Australia. In 2012, Republican presidential candidate Newt Gingrich stated that "when we have 13,000 Americans living on the Moon, they can petition to become a state," as a way of supporting American colonization of Earth's satellite. There are four categories of terra nullius, land that is unclaimed by any state: the small unclaimed territory of Bir Tawil between Egypt and Sudan, Antarctica, the oceans, and celestial bodies such as the Moon or Mars. In the last three of these, international treaties (the Antarctic Treaty, the United Nations Convention on the Law of the Sea, and the Outer Space Treaty respectively) prevent colonization and potential statehood of any of these uninhabited (and, given current technology, not permanently inhabitable) territories. Nevertheless, there have been hypothetical proposals for such a development, should future technological advances and political changes allow for it. In a December 29, 2011, column in The Times, David Aaronovitch said in jest that the UK should consider joining the United States, as the British population cannot accept union with Europe and the UK would inevitably decline on its own. He also made an alternative case that England, Scotland, Wales should be three separate states, with Northern Ireland joining the Republic of Ireland and becoming an all-Ireland state. The United Kingdom has sometimes been called the 51st state due to the "special relationship" between the two countries, particularly since the close cooperation between Franklin D. Roosevelt and Winston Churchill during World War II, and more recently continued during the premierships of Margaret Thatcher and Tony Blair. During World War II, when Denmark was occupied by Nazi Germany, the United States briefly controlled Greenland for battlefields and protection. In 1946, the United States offered to buy Greenland from Denmark for $100 million ($1.2 billion today) but Denmark refused to sell it. Several politicians and others have in recent years argued that Greenland could hypothetically be in a better financial situation as a part of the United States; for instance mentioned by professor Gudmundur Alfredsson at University of Akureyri in 2014. One of the actual reasons behind US interest in Greenland could be the vast natural resources of the island. According to Wikileaks, the U.S. appears to be highly interested in investing in the resource base of the island and in tapping the vast expected hydrocarbons off the Greenlandic coast. Edi Rama, Tirana's mayor and leader of the opposition Socialists, said: "Albania is for sure the most pro-American country in Europe, maybe even in the world ... Nowhere else can you find such respect and hospitality for the President of the United States. Even in Michigan, he wouldn't be as welcome." At the time of ex-Secretary of State James Baker's visit in 1992, there was even a move to hold a referendum declaring the country as the 51st American state. In addition to Albania, Kosovo which is predominately Albanian is seen as a 51st state due to the heavily presence and influence of the United States. 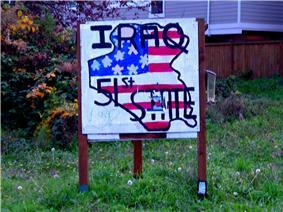 The US has had troops and the largest base outside US territory, Camp Bondsteel in the country since 1999. In 2010 there was an attempt to register a 51st State Party with the New Zealand Electoral Commission. The party advocates New Zealand becoming the 51st state of the United States of America. The party's secretary is Paulus Telfer, a former Christchurch mayoral candidate. On February 5, 2010, the party applied to register a logo with the Electoral Commission. The logo – a US flag with 51 stars – was rejected by the Electoral Commission on the grounds that it was likely to cause confusion or mislead electors. As of 2014, the party remains unregistered and cannot appear on a ballot. However, in Article 3 of the Treaty of San Francisco between the Allied Powers and Japan, which came into force in April 1952, the U.S. put the outlying islands of the Ryukyus, including the island of Okinawa—home to over 1 million Okinawans related to the Japanese—and the Bonin Islands, the Volcano Islands, and Iwo Jima into U.S. trusteeship. All these trusteeships were slowly returned to Japanese rule. Okinawa was returned on May 15, 1972, but the U.S. stations troops in the island's bases as a defense for Japan. Despite the United Nations guarantee of the protection and preservation of Japanese sovereignty, some American congressmen insisted they should annex a war-defeated Japan. The U.S. armed forces rejected such a plan during the Japanese Instrument of Surrender on the USS Missouri. Several websites assert that Israel is the 51st state due to the annual funding and defense support it receives from the United States. An example of this concept can be found in 2003 when Martine Rothblatt published a book called Two Stars for Peace that argued for the addition of Israel and the Palestinian territories surrounding it as the 51st state in the Union. The American State of Canaan, is a book published by Prof. Alfred de Grazia, political science and sociologist, in March 2009, proposing the creation of a 51st from Israel and the Palestinian territories. Time Magazine columnist Mark Thompson suggested that Haiti had effectively become the 51st state after the 2010 Haiti earthquake, with the widespread destruction prompting a quick and extensive response from the United States, even so far as the stationing of the U.S. military in Haitian air and sea ports to facilitate foreign aid. Cuba, like many Spanish territories, wanted to break free from Spain. A pro-independence movement in Cuba was supported by the U.S., and Cuban guerrilla leaders wanted annexation to the United States, but Cuban revolutionary leader José Martí called for Cuban nationhood. When the U.S. battleship Maine sank in Havana Harbor, the U.S. blamed Spain and the Spanish–American War broke out in 1898. After the U.S. won, Spain relinquished claim of sovereignty over territories, including Cuba. The U.S. administered Cuba as a protectorate until 1902. Several decades later in 1959, the corrupt Cuban government of U.S.-backed Fulgencio Batista was overthrown by Fidel Castro. Castro installed a Marxist–Leninist government allied with the Soviet Union, which has been in power ever since. Due to geographical proximity of the Central American countries to the U.S. which has powerful military, economic, and political influences, there were several movements and proposals by the United States during the 19th and 20th centuries to annex some or all of the Central American republics (Costa Rica, El Salvador, Guatemala, Honduras with the formerly British-ruled Bay Islands, Nicaragua, Panama which had the U.S.-ruled Canal Zone territory from 1903 to 1979, and formerly British Honduras or Belize since 1981). However, the U.S. never acted on these proposals from some U.S. politicians; some of which were never delivered or considered seriously. In 2001, El Salvador adopted the U.S. dollar as its currency, while Panama has used it for decades due to its ties to the Canal Zone. In 1847-48, with the United States occupying Mexico at the conclusion of the Mexican-American War, there was talk in Congress of annexing the entirety of Mexico; see All of Mexico Movement. The result was the Mexican Cession, also called Guadalupe Hidalgo for the town in which the treaty was signed, in which the U.S. annexed over 40% of Mexico. Talk of annexing all of Mexico disappeared. A few groups in Canada have actively campaigned in favor of joining the United States. These annexationist movements have not attracted large mainstream attention, although surveys have found that a small minority of Canadians expressed support for the concept in surveys done by Léger Marketing in 2001  and in 2004. In 1948, during the last days of the Dominion of Newfoundland (at the time a dominion-dependency in the Commonwealth and independent of Canada), there was mainstream support, although not majority, for Newfoundland to form an economic union with the United States, thanks to the efforts of the Economic Union Party and significant U.S. investment in Newfoundland stemming from the U.S.-British alliance in World War II. The implication has historical basis and dates to the breakup of British America during the American Revolution. The colonies that had confederated to form the United States invaded Canada (at the time a term referring specifically to the modern-day provinces of Quebec and Ontario, which had only been in British hands since 1763) at least twice, neither time succeeding in taking control of the territory. The first invasion was during the Revolution, under the assumption that French-speaking Canadians' presumed hostility towards British colonial rule combined with the Franco-American alliance would make them natural allies to the American cause; the Continental Army successfully recruited two Canadian regiments for the invasion. That invasion's failure forced the members of those regiments into exile, and they settled mostly in upstate New York. The Articles of Confederation, written after the Revolution, included a provision for Canada to join the United States, should they ever decide to do so, without needing to seek U.S. permission as other states would. The United States again invaded Canada during the War of 1812, but this effort was made more difficult due to the large number of Loyalist Americans that had fled to what is now Ontario and still resisted joining the republic. The Hunter Patriots in the 1830s and the Fenian raids after the American Civil War were private attacks on Canada from the U.S. Several U.S. politicians in the 19th century also spoke in favour of annexing Canada. In Canada, "the 51st state" is a phrase generally used in such a way as to imply that if a certain political course is taken, Canada's destiny will be to be annexed into the United States as "the 51st state". Examples include the Canada-United States Free Trade Agreement in 1988, the debate over the creation of a common defense perimeter, and as a potential consequence of not adopting proposals intended to resolve the issue of Quebec sovereignty, the Charlottetown Accord in 1992 and the Clarity Act in 1999. If Canada and Mexico were to join the United States, the number of states will rise to 95. This flag proposal, however, has 96 stars. Arizona: The secession of Pima County in Arizona with the hopes of Cochise, Yuma, and Santa Cruz joining to form a state. Jefferson, from Northern California and Southern Oregon. Various proposals of partition and secession in California, usually involving splitting the south half from the north or the urban coastline from the rest of the state. California's Secretary of State allowed Tim Draper to start collecting signatures for his petition to split California into six different states. The initiative drive did not gain sufficient valid signatures to be put on the ballot. Colorado: On June 6, 2013, commissioners in Weld County, Colorado announced a proposal to leave Colorado along with neighboring counties and form the state of North Colorado. The counties in contention voted to begin plans for secession on November 5, 2013, with mixed results. Delaware, Maryland and Virginia: Delmarva, from the eastern shores of Maryland and Virginia combining with the state of Delaware, or more often, only Kent County and Sussex County, Delaware. Florida: The secession of South Florida and the Greater Miami area to form the state of "South Florida." South Florida has a population of over 7 million, comprising 41% of Florida's population. Illinois: The secession of Cook County, which contains Chicago, from Illinois to form a state. Chicago sits in the northeast corner of the state, with the remainder of the Illinois sometimes referred to as Downstate Illinois. Such proposals have invariably come from the more Republican downstate Illinois, as a way to end the dominance in statewide politics of the overwhelmingly Democratic Chicago area. Stronger moves have been made to form Southern Illinois "The Great Rivers State". With the separation being south of Springfield, the capitol would be in Mt. Vernon. Michigan and Superior: The northern part of Michigan known formally as the Upper Peninsula of Michigan, and informally as Yooper Land, the Yooper Peninsula, or Superiorland. Note that the Upper Peninsula of Michigan is actually north of the region of the Lower Peninsula normally known in lower Michigan as "Northern Michigan", which tends to cause some confusion. Texas: Under the joint resolution of Congress by which the Republic of Texas was admitted to the Union, it had the right to divide itself into as many as five different states. It is not clear whether this provides any power beyond that already provided by the Constitution. What is clear is that the Texas Legislature would have to approve any proposal to divide the state using this prerogative. There were a significant number of Texans who supported dividing the state in its early decades. They were generally called divisionists. The Texas Constitution and the Texas Annexation Act both provide for the possibility of Texas voting to divide into up to five sovereign States of the Union. Current Texas politics and self-image make any tampering with Texas' status as the largest state by land area in the contiguous United States unlikely. The National Movement for the Establishment of a 49th State, founded by Oscar Brown, Sr. and Bradley Cyrus and active in Chicago in 1934–37, had the aim of forming an African American state in the South. There exist several proposals to divide states with regions that are politically or culturally divergent into smaller, more homogeneous, administratively efficient entities. Splitting a state would need to receive the approval of its legislature and the Congress. The Philippine statehood movement had a significant impact during the early American colonial period. It is no longer a mainstream movement, but is a small social movement that gains interest and talk in that nation. For the Philippine presidential election, 2016, one candidate, Arturo Pacheco, intends to push to make the Philippines the next US state should he get elected. The Philippines has had small grassroots movements for U.S. statehood. Originally part of the platform of the Progressive Party, then known as the Federalista Party, the party dropped it in 1907, which coincided with the name change. As recently as 2004, the concept of the Philippines becoming a U.S. state has been part of a political platform in the Philippines. Supporters of this movement include Filipinos who believe that the quality of life in the Philippines would be higher and that there would be less poverty there if the Philippines were an American state or territory. Supporters also include Filipinos that had fought as members of the United States Armed Forces in various wars during the Commonwealth period. A hypothetical merging of several former and current Pacific US territories into a single state. In 2014, a "Decolonization Registry" was created to have a non-binding vote on the future status of Guam in relations to the United States; it failed to register the 70% of native inhabitants, therefore no vote will be held. The limiting of the registry to only native inhabitants had resulted in lawsuits challenging this restriction as discriminatory. 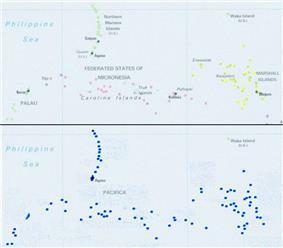 Other less likely contenders are Northern Mariana Islands would be admitted as one state, along with Palau, the Federated States of Micronesia, and the Marshall Islands (although these latter three entities are now separate sovereign nations, which have Compact of Free Association relationships with the United States). Such a state would have a population of 412,381 (slightly lower than Wyoming's population) and a land area of 911.82 square miles (2,361.6 km2) (slightly smaller than Rhode Island). American Samoa could possibly be part of such a state, increasing the population to 467,900 and the area to 988.65 square miles (2,560.6 km2). Radio Australia, in late May 2008, issued signs of Guam and the Northern Mariana Islands becoming one again and becoming the 51st state. Another proposed option would be to have Maryland, from which the current land was ceded, retake the District of Columbia, as Virginia has already done for its part, while leaving the National Mall, the United States Capitol, and the White House in a truncated District of Columbia. This would give residents of the city of Washington the benefit of statehood while precluding the creation of a 51st state. This position was carried by the D.C. Statehood Party, a minor party; it has since merged with the local Green Party affiliate to form the D.C. Statehood Green Party. The nearest this movement ever came to success was in 1978, when Congress passed the District of Columbia Voting Rights Amendment. Two years later in 1980, local citizens passed an initiative calling for a constitutional convention for a new state. In 1982, voters ratified the constitution of the state, which was to be called New Columbia. The drive for statehood stalled in 1985, however, when the Washington, D.C. Voting Rights Amendment failed because not enough states ratified the amendment within the seven-year span specified.